Last Saturday (18th June) the Lancaster and Morecambe Makers were hosting a ‘Gadget Destruction’ workshop as a part of the Lancaster Mini Fun Palace. Well it is as simple as it says on the tin, it is a chance to take apart gadgets and items and see how they tick. We all pass through the stage of wanting to pull apart things to see how they work (some of us never leave that stage). Often though we do not get the chance. If they are functional then our parents/guardians and siblings might be a little miffed if we take a screwdriver to the items. If they are broke we may not be praised for the mess or potential danger. Gadget Destruction with the local Makers gets around that issue. We have a bunch of adults who have happily taken things apart for years and sometimes put them back together, fixed, or as essential components in something new. We also have a lot of experience in guessing a function by what the item is connected to, and we learned those from friends, books, the internet, TV and by pulling stuff apart. We like to share in taking things apart and we want to make sure that people learn the skill in doing that. It isn’t just by force (though occasionally force is used) mostly it is by working out the many ways that things are fixed, learning how to take it apart helps in learning how to put it back together. We are also experienced in knowing what can be a danger before you take a screwdriver to it (so we took away batteries and other hazardous items that were easy to remove or taken out during the destruction process). We had a great time. 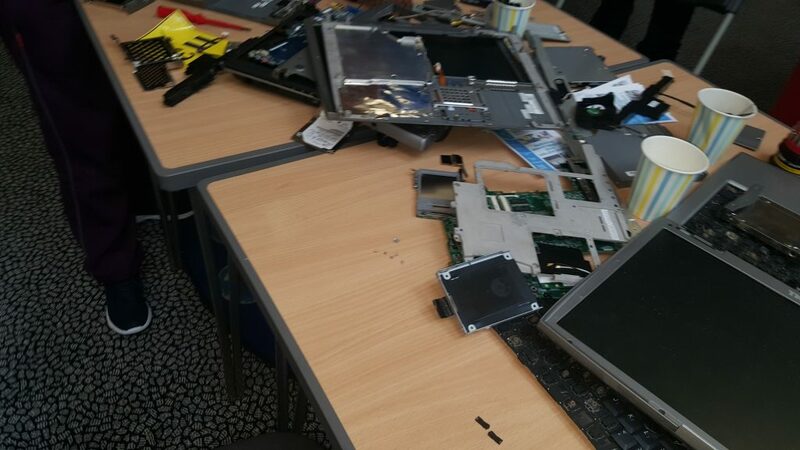 Thanks to a whole load of gadgets donated to take apart, laptops, monitors, desktops and other assorted paraphernalia. Some people even brought their own. We had a spectacular group of people who came to visit us. I didn’t have time to count how many came through but at one point there were twenty children between ages three to twelve, with their parents, all taking something apart. 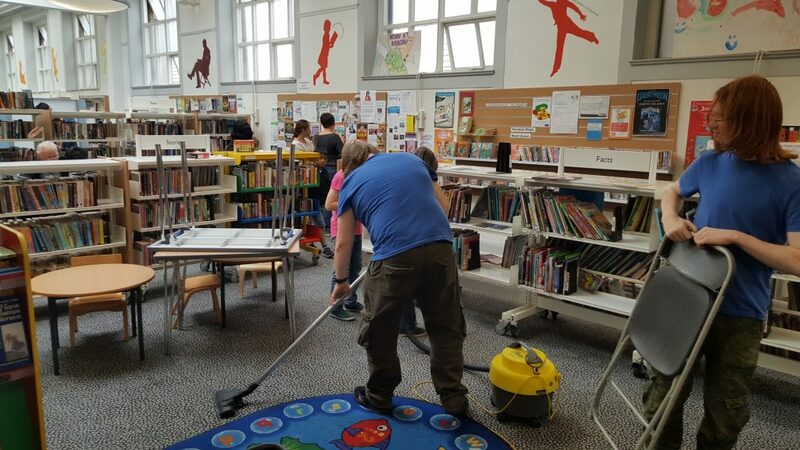 The Library staff and Fun Palace organisers were very helpful and very supportive and seemed to love allowing us to cause a small area of mayhem in the centre of the library (we did however clean up after ourselves). The thrill of being able to pull apart a laptop, or a TV or a toaster was exhilarating and liberating. 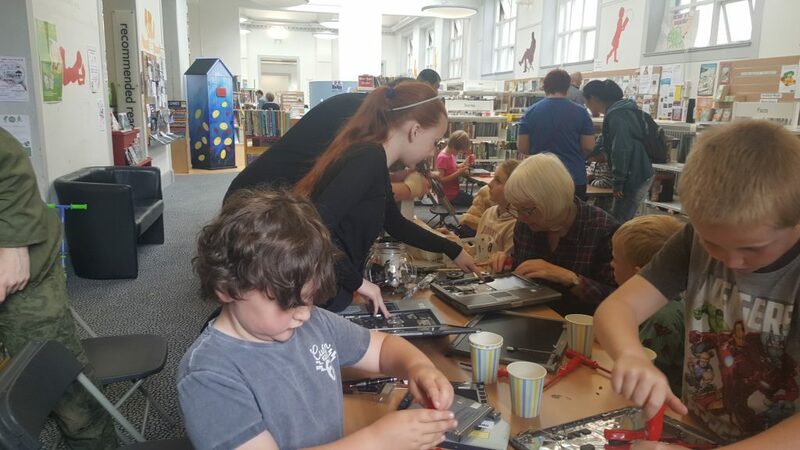 The look of delight on faces when asked ‘what can I take apart’ and you answer ‘want to pull the rare magnets out of a laptop?’. 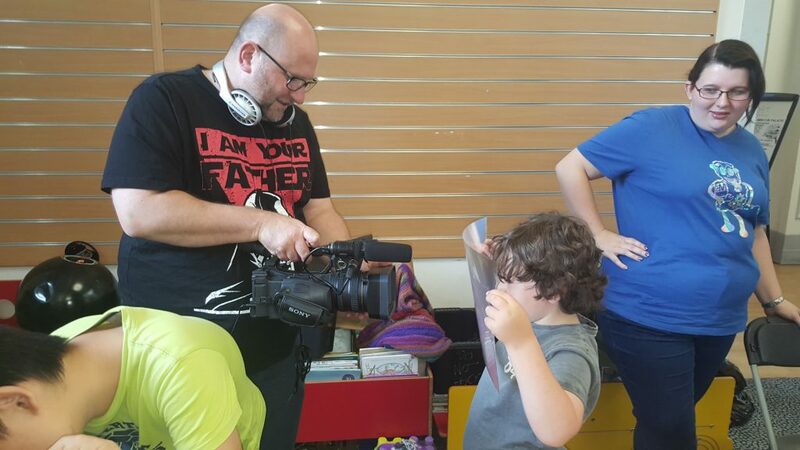 As for me, I brought along a five year old who loved being able to take apart a laptop and spent a good twenty minutes playing with diffusers from a television. It was ace. So even though I was a part of this and loved being on the ground on the day, I want to say thanks to all my fellow LAMMers. This includes those who couldn’t make it on the day but helped in the preparation and take down of the event. You’re all stars.